Bird Feeders Made in the USA by Looker Inc. Our clients include over 650 specialty stores nationwide. Looker is a leading manufacturer of Window House. Beige PVC foam and Natural Western Red Cedar Construction. 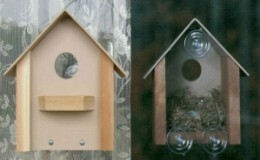 Clear plastic back attaches to outside of window for clear viewing of nestlings. Black privacy shield included for inside of window. This shield keeps nest secluded from your home activity. 7" x 6" x 8". Bracket has 3 medium suction cups. Privacy Shield has 1 medium suction cup.